1. Bathroom break. Whether you actually have to "go" or not is beside the point. This is one of the most valuable cards in your deck, but you can only use it once, so plan wisely. If it's a dinner with the in-laws, I recommend saving the restroom break until the after-dinner conversation has begun. Until then, the food is enough to keep me stress-free. 2. 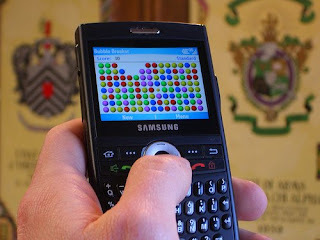 Cell phone games and text messages. This is a good way to pull yourself out of a conversation, especially in a large group setting. Nothing says, "Yeah, I'm listening, oh but wait, something important just came up" like a sudden grasp of the cell phone followed by five minutes of furious typing (be sure to keep a furrowed brow and nod occasionally)... whether an invigorating game of Bejeweled or texting an SOS to a close friend, this trick is sure to buy you at least five minutes of emergency alone time. 3. More sugar. If a coffee meeting gets stressful, always be mindful of the condiment table located at the front of the coffee shop. That table could be your oasis when the conversation turns uncomfortably personal or awkwardly lame. Take a sip of your brew, make an irritated face, and simply excuse yourself with the statement, "Needs more sugar," and you're free! Just be sure to come back with a new conversation starter or else it's all for naught. 4. Messy shirt. This one's only for those rare but most desperate situations when, for example, you've already used your "coffee needs sugar" escape, your cell phone interruption, and your bathroom break... then there's only one thing left to do: you must sacrifice your shirt and "accidentally" drop your food (or your coffee) down your torso- be sure to make a small scene in the process (for effect). This will not only permit but oblige you to excuse yourself from the table and buy you at least ten minutes away. If you're really good, you'll remember when you emerge from the bathroom that you have an extra shirt in the car (this takes careful planning and forethought but can afford you another five minutes). 5. If all these tactics still leave you clawing at the walls... better find the wine and keep it close, my friend... I'm afraid you're in for the long-haul. You can also poo or pee your pants in the most desperate of situations. I guarantee that will always work. Excellent suggestions (and I like the one anonymous suggestion as well. Another lesser used alternative is to excuse yourself, go into the bathroom, take off all of your clothes and return to the table naked while pretending like you're still fully dressed.